Parallel Lives + Anointed Procession = Infinite Combo? duplicating tokens as an "entering the battlefield" triggered ability? My latest thought is changing the secondary thing to tokens instead of +1/+1 counters. 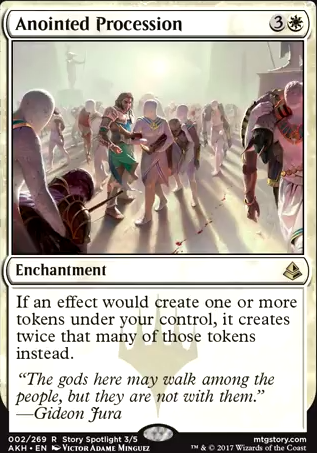 I would also use cards like Doubling Season , Primal Vigor , Parallel Lives , and Anointed Procession to increase the number of tokens generated. Maybe use anthems to boost my tokens? 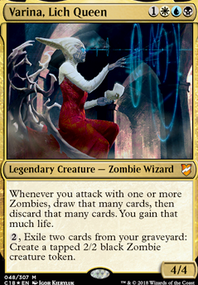 I could also use cards like Rite of Replication and Growing Ranks . Should I try that approach to birds instead? And if yes, do I edit this deck or make a new deck on this site? Not sure what is easiest for working on a deck and getting other people's input. +1'd! I like the look of your list, if you've had a few chances to try it out I'd love to hear if Primal Amulet Flip and Guttersnipe been doing well for you! Those are a couple of cards I'd like to try out in my own list, which can be found here if you'd like to take a look. For some suggestions, I'd second Skullclamp if you enjoy the token route. It in place of Anointed Procession will likely give you better results; Procession costs a lot of mana initially and is pretty much only going to be making you additional 1/1's throughout the game. While it could be generating a BUNCH of 1/1's, the nature of your token producers require you to cast cards. Skullclamp will instead give you opportunity to gas up and generate more 1/1's in its own way. If you are going for a lot of tokens Anointed Procession will really help the deck out. If you are looking for more token generation then Anointed Procession will let you double the amount you are making, also helping Smothering Tithe make double treasure tokens. I think that splashing with black might be the way to go since it would give me access to the flashback feature of Lingering Souls . I like the idea of Priest of Forgotten Gods but I don't think sacking tokens would be a good idea without a way to get them back. I was toying with the idea of using Furystoke Giant as another possible win-con where I turn all the tokens into Shock essentially. Use Cloudshift to bounce Furystoke Giant to recreate the effect, but this would mean going a different direction as far as color splashing but it would open the door to Impact Tremors . The Furystoke Giant was my main idea when I started putting this together but I started looking into as many token generating cards as possible and red sort of worked its way out of the deck. Honor of the Pure seems like a must have card in this build as well as Anointed Procession , I knew there was a card like this out there and that you'd know what it was! 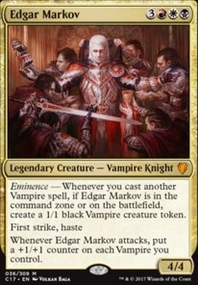 I agree that Champion of the Parish probably is not the best fit here, most of the tokens generated aren't specifically human, at least not enough to make it a game changer. What do you think of the Furystoke Giant combo, any cards you think would tie into the general concept? How to deal with Ratchet Bomb or other boardwipes - that's a big issue. While Brave the Elements does great against targeted removal, something that will prevent global effects will be much more difficult in mono-white. Mana Tithe comes to mind, but isn't particularly reliable. Something like Blood Artist seems like it could be good. If you decide to splash black, Priest of Forgotten Gods might add a second dimension to this otherwise straightforward build. Of course, splashing blue for Negate , etc would work, too. and with green, you'd of course gain access to Heroic Intervention . It's probably a good idea to have a solid one drop spell to get things rolling on T1, but I have doubts about Champion of the Parish in that slot. Doomed Traveler seems like a better fit, and Soul's Attendant or Soul Warden are sure-bets. 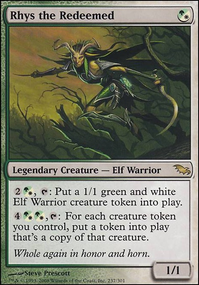 In terms of non-token creatures, Thalia's Lieutenant might also be worth considering, but only to pump any tokens you have in play. At 2CMC, I think it would be competing for mana with your 2-drop token spells. That said, the 4x pumps Intangible Virtue provide won't be reliable. Honor of the Pure , while offering less value in many ways than both Virtue and Lieutenant, is still probably better than the Lieutenant here. Probably needs at least 2x more lands, if not 4x more to reliably get the mana to cast Elspeth, Sun's Champion . Otherwise, it will likely be a dead card most games. I also suggest reducing Elspeth to 1-2x. If you splash red for Impact Tremors, Chained to the Rocks might be worth considering. I'd drop 1x Disenchant for 1x Oblivion Ring , or add at least 3x Oblivion Ring s to the sideboard. 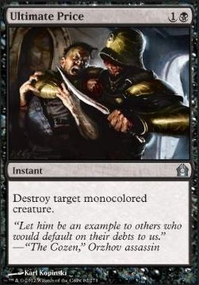 I also suggest adding Pithing Needle , Elixir of Immortality , Revoke Existence , Teyo, the Shieldmage , and Nevermore to the sideboard.